These Keto Cheeseburger Stuffed Peppers are quick and easy to make, with just three basic ingredients and ready in 30 minutes. Great for a quick weekday main dish or a fun party appetizer. You don’t even need a side dish to serve these – they are almost like mini cheeseburger sliders, but low-carb and keto. I already shared with you a recipe for Keto Stuffed Peppers With Cauliflower Rice and you guys seemed to love them. Now I have another stuffed peppers recipe, loaded with meat and cheese. I used mini peppers in the recipe. This way you get bite sized peppers, that cook fast. What if you don’t have mini peppers and would like to use regular bell peppers. You could. But make sure you cut them in half and increase the cooking time, since the layer of ground beef will be thicker. 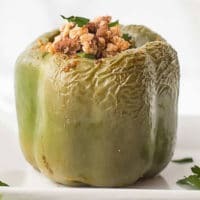 Besides this Keto Cheeseburger Stuffed Peppers Recipe, I also have a couple of other stuffed mini peppers recipes, you may want to check out – Mini Peppers With Whipped Feta and Feta and Egg Stuffed Mini Peppers. These ground beef stuffed mini peppers are also kid friendly and a great size for toddlers. How to season ground beef for stuffed peppers? I used salt, black pepper, garlic powder, ground cumin, paprika, Italian seasoning and grated onion. Yeah, I use garlic powder, but then take the time to grate some onion. 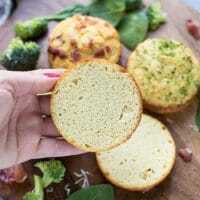 Garlic powder is a great shortcut in recipes like this. Why did I use grated onion? Because of the juice it releases when grated, this juice adds extra moisture and great flavor in ground meat. If you’d like to take a shortcut, feel free to use onion powder, I’ll add the amount in the recipe notes. I also added one egg white to the ground beef, it helps with binding, but again, it is optional. How to make Low-Carb, Keto Cheeseburger Stuffed Peppers? For this Low-Carb, Keto Cheeseburger Stuffed Peppers Recipe I used 90% ground siriloin, but ground beef with higher fat content will also work. The more fat, the better for keto. You prepare the ground beef and fill the peppers with it. It takes around 1 to 1 1/2 tbsp of the mixture to fill one half medium mini pepper. Then you bake the peppers for 15 minutes at 350F, until the beef is cooked. Top with grated mozzarella and bake for 3-4 more minutes, until melted and bubbly. While these Keto Cheeseburger Stuffed Peppers taste best when they are right out of the oven, you can keep them in the fridge in an air-tight container for up to one week. Low-Carb, Keto Cheeseburger Stuffed Peppers Recipe - colorful mini peppers, cut in half lengthwise, stuffed with ground beef and topped with melty cheese. Preheat oven to 350F. Spray a baking sheet with olive oil spray. In a bowl, combine the beef, seasoning, grated onion and egg white. Mix to combine. Cut each pepper in half lengthwise and remove the seeds. Fill with the ground beef mixture, leaving the top flat. Bake for 20 minutes or until the peppers have softened and the beef is cooked through. Top with cheese. Bake for additional 3-4 minutes. Top with chopped parsley (optional). Serve. Serving size - 2 peppers/4 halves. More salt could be used in the ground beef to taste. Keep in mind that the addition of cheese on top of the peppers adds saltiness. If you are not planning to use fresh onion, use 2 tsp onion powder instead of 1 small onion. To make it easier, when you grate the onion, I suggest that you put it in the freezer for 15 minutes prior. This will make it firm and easy to grate. Oh my, these look so delicious! Such a great idea for summer hosting and even for a light dinner. YUM! Mira, these are SO fun! I saw your photo on IG and couldn’t wait to see the recipe. I’m pinning and can’t wait to make this. I think these would be a hit at any party! LOVE this idea! So good! I love stuffed peppers – and these look really good!! How soon before putting them in oven can I prep these and keep in fridge? I would like to prep during early afternoon before kids get home and chaos ensues 🙂 then pop in oven at dinnertime. Hi April, you can easily make them ahead and keep in the fridge before baking for 2 days. I made these for dinner tonight. They were just ok. They were easy enough and didn’t take long which was nice. For me they needed more of that taco like kick that the cumin only hints at. I think next time I will just mix in a taco seasoning packet instead and then bake using these directions. Thanks! You are welcome to use any seasoning of your choice. These are not taco peppers and my family is not a fan of taco seasoning, this is why I did not use any. These are cheeseburger peppers, cheeseburger meat does not have a ton of seasoning. Great! Hope you like these Judy. Keep in mind that you can add some extra seasoning to your taste, some readers have been adding taco seasoning. This was an excellent recipie. I’m not normally a stuffed peppers fan but this was so good. 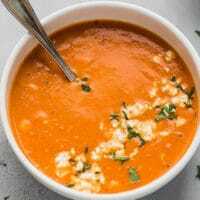 I served mine over a bed of spinach and garnished with chopped avocado, chopped tomato, scallions, and a dollop of sour cream. So happy to read your comment! Glad you’ve enjoyed them! Great serving suggestion!